WE CAME. WE SWAM. WE MEDITATED. ALAS, THIS RETREAT HAS COMPLETED. TO STAY IN THE LOOP ABOUT UPCOMING RETREATS LIKE THIS ONE, SIGN UP BELOW. A nature reserve and volcanic lake that is so rich in minerals that it has no fish. It's the site of dark sand beaches for swimming, kayaking, paragliding and petroglyphs of the ancient indigenous people who called Nicaragua home. This is also the site of our upcoming meditation retreat January 20 - 26th 2018 and we would love to have you join us. Megan Mook (left) specializes in meditation for emotional intelligence, with an emphasis on developing compassion. She holds a Masters in Buddhist Studies from the International Buddhist College in Thailand, and has studied Tibetan scriptural translation at Columbia University. She is the Head Teacher at MNDFL meditation studio in Williamsburg, Brooklyn. ✨ NOTE :: There will be plenty of free time for napping, swimming, reading, meandering, lounging, etc. Apoyo Lodge is about 1 Hour + 20 minutes from the only International airport in Nicaragua. They will pick you up from and drop you off at the airport on travel days. You will need a passport that is valid 6 months prior to arrival + after departure date. ✨ NOTE:: All lodging accommodations are shared. If you need / want a private room, please let me know and we will try to work it out. French doors open to private patio with views of the lagoon. Private rooms nestled in the forest. WHAT'S THE RETREAT GOING TO BE LIKE? Part of learning to meditate nicely, with love in our hearts, is giving ourselves enough to time to slow down and heal from our hectic lives. 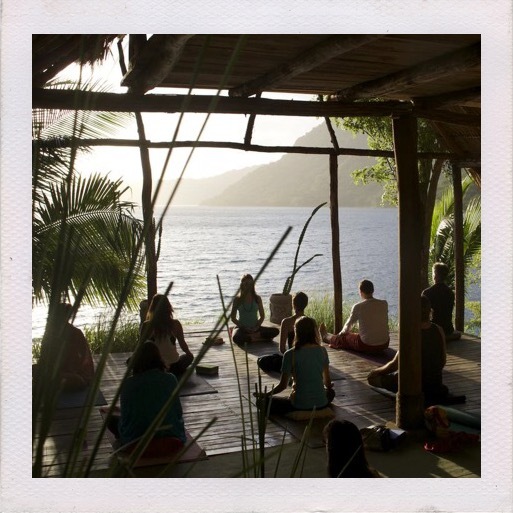 This retreat balances relaxed healing with structured practice time. The retreat is structured in three parts: warm-up, genuine-retreat, and cool-down. During the warm up and cool down, we'll have morning meditation + yoga and evening mediation. We'll also enjoy some afternoon cultural day-trips. During the middle part of the retreat, we'll slow down a little more with 3 practice sessions a day. Both yoga and mediations classes will be suitable for all levels. Very. The UN reported it as the safest country in Central America. Nicaragua is "the next Costa Rica." Come enjoy its splendors before it gets fully developed. WHAT IS THE BEST TIME TO ARRIVE AND DEPART? As you're looking at airfare, we recommend arriving in the morning/ afternoon of January 20th. We'll formally 'open' the retreat that evening at 6pm, and the Lodge is amenable to picking folks up at the airport anytime through the day, so there's a wide window for arrival times. As for departure, we'll be formally 'closing' the retreat the evening of the 25th, so anytime you would like to book your departing flight on the 26th is good by us (we recommend morning/afternoon). We'll be hosting an optional open sit and breakfast on the morning of the 26th as folks pack up and begin transitioning out. ✨ NOTE : We do encourage participants arrive and depart on the 20th and the 26th. Because the retreat center is a multi-purpose space, there’s a good chance that another retreat /event will be in process or just ending the day before ours begins. So for the purpose of creating a cohesive retreatant experience, we’re asking that we all arrive together. ✨NOTE :: THERE IS A $600 NON-REFUNDABLE DEPOSIT TO HOLD YOUR SPOT. PAYMENT PLANS AVAILABLE. * If you’d like to room with someone specific, please let me know.